Why am I Sharing my Lifestyle Secrets? You might ask why I am sharing my Lifestyle secrets. Why would I release my findings and the results of my research and my interviews with successful people? The answer is simple. These are secrets you do not keep! Lifestyle tips, advice and strategies are to be shared with anyone and everyone. The bottom line is that just like you I want to make the world a better place. I also want to help you make your life outstanding! I wish I could have had the knowledge about creating lifestyle, before I went through all of the challenges I had to go through. I decided a few years ago that I would write a book revealing all I have learned about creating a wonderful lifestyle. No-one else needs to go through what I went through and make all the same mistakes I made. 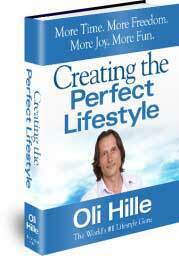 I can teach you how to quickly and effectively build a terrific life. I see too many people who are working, working, working just to make ends meet. I see people who long ago had big dreams and aspirations but now they only aspire to pay the mortgage and get by. I meet people who have great skills and abilities that could be used to really make a difference in the world, but they are using their skills to make someone else wealthy. I talk to people who would love to have more time to volunteer and serve their community but who are so busy working 50 or 60 hours a week that they arrive home exhausted and stressed and unable to give back to anyone. I know people who have a call on their lives to make a real difference in the developing world but who have been sucked into our Western material culture, and they are not satisfied because they are not living their true calling. I see parents who would love to spend tons of quality time with their kids, but they both have to work to pay the bills. I know people who have wonderful creative skills and who should be writing a novel, painting, acting, thinking, making, creating… but they are held back by limiting beliefs or mental barriers or their peers or their upbringing. We all know people who are in the wrong job or the wrong occupation but because of a fear of the unknown, stay where they are, unhappy and not fulfilled. I see people (just like I used to be) working for someone else when they should be using their ideas and skills working for themselves. We all read about people who get depressed and anxious even though they have far more wealth and opportunity than 98% of the people on earth. Something is terribly wrong with these pictures! So yes, I want to make the world a better place. And yes I want to make your world a better place. Give yourself permission to get frustrated. Get frustrated with your own situation, with where your friends and loved ones are at, with what is going on in the world. Get motivated to change. Find the leverage you need to make changes in your life. While you are frustrated and annoyed and you have the leverage, make decisions now. Decisions that will have positive benefits to you and those around you for years and perhaps decades, and possibly even generations.